My last visit to the Least Tern colony, where a fledgling danced every time Mom brought in a fish for breakfast! A quiet morning of lying on the sand yielded some amazing images of two Least Terns with their day-old chick. He was so cute! Lots of Action at the Matanzas Tern Colony! Lots of action at the Matanzas Tern Colony, with Least Tern courtship, fish exchanges, and skirmishes with the predator ghost crabs! 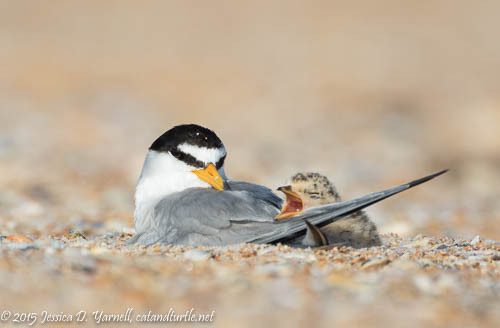 Back in June, I got to photograph tiny newborn Least Tern chicks with their parents. There was such excitement when Dad brought in a fish! I finally got to photograph some Least Tern piggy-back rides this spring! Back in June, I photographed some fun Least Tern courtship. The male’s fish was rejected by his unfeeling prospective suitor! I was pleased to donate the use of one of my photographs to American Bird Conservancy’s Help Gulf Birds website aimed at protecting shorebirds on Florida’s coasts. Check it out! I’m still going through my images from Saturday morning at the Fort Matanzas tern colony. There was a nest that was very very close to us, and it was incredible! So I’ll have a full post tomorrow, and until then, here’s a teaser…no vacancies!